The student who orchestrated the attack used a shotgun and a .38 revolver he apparently took from his father. 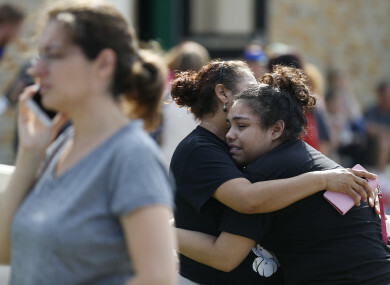 Santa Fe High School junior Guadalupe Sanchez, 16, cries in the arms of her mother, Elida Sanchez, after reuniting with her at a meeting point at a nearby Alamo Gym fitness centre following a shooting at Santa Fe High School in Santa Fe, Texas. TEN PEOPLE, MOSTLY students, were killed when a 17-year-old classmate armed with a shotgun and a revolver opened fire in a Texas high school, in the latest deadly school shooting to hit the United States. The gunman, who was arrested on murder charges, was identified as Dimitrios Pagourtzis, a 17-year-old junior at Santa Fe High School in Santa Fe, Texas. Governor Greg Abbott said 10 people died and another 10 were wounded in what he called “one of the most heinous attacks that we’ve ever seen in the history of Texas schools”. “Nothing can prepare a parent for the loss of a child,” Abbott told reporters in Santa Fe, located some 30 miles (50 kilometres) southeast of Houston. Abbott said the gunman apparently carried out the attack with a shotgun and a .38 revolver that were legally owned by his father. The Houston Chronicle said Pagourtzis also threw pipe bombs into a classroom at the start of the school day. The governor said searches were being conducted at two residences and “explosive devices” had been found including a “CO2 device” and a Molotov cocktail. Abbott said there were no “warning signs” about the suspect ahead of time although he did post a picture on his Facebook page of a T-shirt with the words “Born to Kill” on it. Harris County Sheriff Ed Gonzalez said the “majority” of the victims were students. “Officers inside encountered a bloody mess in the school,” a law enforcement official told the Houston Chronicle. Area hospitals said two victims were in critical condition. One of the wounded was a police officer, John Barnes, who engaged the gunman and was shot in the elbow, officials said. “My friend got shot in the art hall,” a weeping Santa Fe student, Dakota Shrader, told reporters. Shrader said fire alarms went off “and everybody just started running outside. Earlier this year, 17 people were killed at a Florida high school – a massacre that prompted survivors to launch a grassroots campaign against gun violence. It was the second mass shooting in Texas in six months. Twenty-six people were killed in a Texas church in November 2017 by a 26-year-old Air Force veteran. Abbott, the Texas governor, said he would convene roundtable discussions to look into ways to prevent such mass shootings in the future. President Donald Trump expressed “sadness and heartbreak” over the shooting and ordered US flags to fly at half-staff for the next few days. “This has been going on too long in our country,” Trump said, speaking at an event on prison reform at the White House. We’re with you in this tragic hour. Trump, who has previously shied away from gun control and proposed arming teachers, said he was “determined to do everything in our power to protect our students, secure our schools, and to keep weapons out of the hands of those who pose a threat to themselves, and to others”. The shooting erupted before 8:00 am, as the first classes of the day were starting. “It was pretty quiet for a few seconds, and then we just hear someone like shoot a gun, and just like a ‘pow-pow-pow,’” student Hunter Mead, 14, told AFP. The Santa Fe shooting came three months after the massacre at Marjory Douglas Stoneman High School in Parkland, Florida, which sparked a student-led movement for tighter gun laws. “We are fighting for you,” tweeted David Hogg, a Stoneman Douglas student who has emerged as a leader of the gun control campaign. Former Democratic presidential candidate Hillary Clinton urged lawmakers to take action. “Every day that we fail to act on gun violence, we are failing our children,” Clinton said on Twitter. Email “'A heinous attack': 10 people killed in Texas high school shooting”. Feedback on “'A heinous attack': 10 people killed in Texas high school shooting”.